What makes a person turn to a life of grumpiness...just read on. Mr. Grumpbump is now proficient with our stove-top espresso maker. There is nothing I like better than my husband making me a cup of coffee. I pretend to be inept at the whole process and ask him to "help" me. The cup I'm enjoying now is super yummy, which is made all the better because he's also cleaning up the percolator too! I let Miss Macy smell my coffee but she was not interested in it all. Her loss. We hired an electrician to put up our ceiling fan and track lighting in the kitchen nook. It is so nice to have actual overhead lights in the living space instead of relying on table and floor lamps. 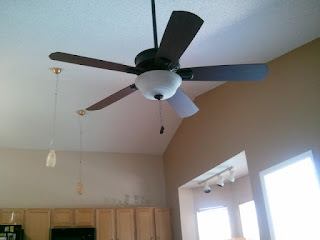 The fan will come in handy once the Florida weather heats up. Mr. Grumpbump also installed a light in the front hallway so he can maneuver the front bedroom in the morning (he keeps his uniforms in the front bedroom closet). Ugh. I love and hate Sunday nights all at once. Sunday nights mean I have to go to work in the morning, but they also represent my last little bit of freedom before the work week. 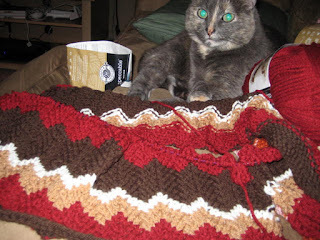 I've started my third version of the Ripple Stitch afghan. I've changed up the striping on the pattern just a bit; not sure how it will turn out. I think the colors (chocolate brown, beige, burgundy/wine and cream) are reminiscent of fall and autumn and hope they work well together throughout the entire project. I'll know more as I knit more rows of the pattern. Delilah made me laugh this morning. She was out on the patio and I was checking up on her when I saw a familiar sight. Delilah had her tail in the pool, while she was drinking water out of the dish Mr. Grumpbump set out for her (it's actually a plant dish, but Delilah insists on drinking water out of it so that's what it is now). I was able to grab my camera to document the moment. Early Saturday afternoon here in Florida and the temperatures are back up in the 70s, although it is overcast right now as I sit on my patio. Maybe overcast is the wrong word; there is a lot of cloud cover and you can't really see the sun or the sky. Just light gray and white clouds everywhere. I'm waiting for Mr. Grumpbump to get back from Lowes. 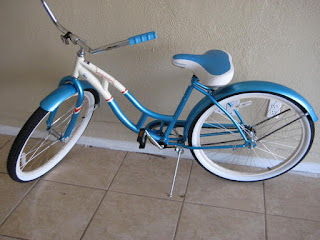 Since receiving a bike for Christmas, Mr. Grumpbump and I go out on Saturday mornings - he runs, I bike. It's the first opportunity I've taken since moving into this house to see the neighborhood and the houses around us. I enjoy riding and would be willing to do more exploring of the other subdivisions on this side of the main roadway. 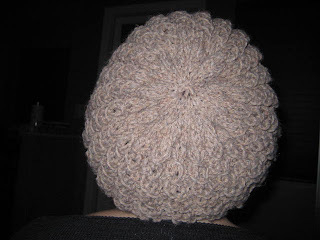 I finished my second slouchy hat in time for the two days of cold weather here in Florida. I love this hat and this time the yarn I used is perfect for the project. 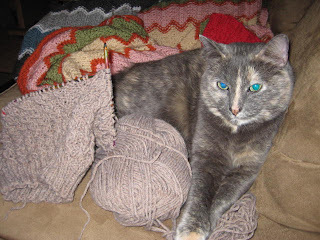 I'm starting another ripple afghan. I'm not feeling the love for it as I have previously, but I attribute that to slouchy hat pattern that I can complete in just a few days. I'm going to have to really focus on this afghan because I think the colors I picked are going to pop. I made white wine sangria today. I was tipsy after only two glasses and promptly passed out on the couch. I spent way too long in Michaels today, trying to decide what yarn to purchase. They had a 50% sale on Country Loom, and I loaded my basket with 10 skeins of it, imagining I would knit an afghan. However, this yarn reminds me too much of Homespun and I had a terrible time trying to knit with it. I put it all back and moved onto a new Bernat yarn called Waverly, which had the most beautiful colors and was so soft. I couldn't think of a pattern to make with it so I put it back too (although by searching their website, I found a beautiful pattern so I might be going back to purchase it). I ended up going with the Loops & Threads Impeccable Yarn (acrylic) in order to make my favorite ripple stitch afghan.